IM UNRUHEPOOL DER GEGENWART Charlie Stein ist eine Künstlerin, die in ihrer Wandelbarkeit und Schnelligkeit immer schon drei Schritte weiter ist als Derjenige, der versucht, ihre Arbeit zu erfassen. Bei unserer ersten Begegnung Ende 2014 in der Stuttgarter Staatsgalerie nutzten wir die letzten 20 Minuten der Öffnungszeit zum Express-Besuch der Schlemmer-Schau. Charlie Stein erfasste rasant die künstlerische Essenz der Werke. Und ich war überrascht, an diesem Künstler noch neue Seiten zu entdecken. Eine Entdeckungsreise, die jäh durch staatliche Museumswächter beendet wurde. An Grenzen geht Charlie Stein gern, um sie dann zu überschreiten. KONSUM In der so einfachen wie hintergründigen Konzept-Arbeit „MINDESTLOHN“ wird der Kassenzettel zum Statementträger. Der „Beleg“, gedruckt auf billigem Thermopapier wird zur Künstleredition und macht einen durch Aufladung überdeterminierten Begriff konkret erfahrbar. Bei einer Guerilla-Aktion macht sie 2014 ihr Lieblingsobjekt – Einkaufwagen – zum Display für Ideen von befreundeten Künstlern. 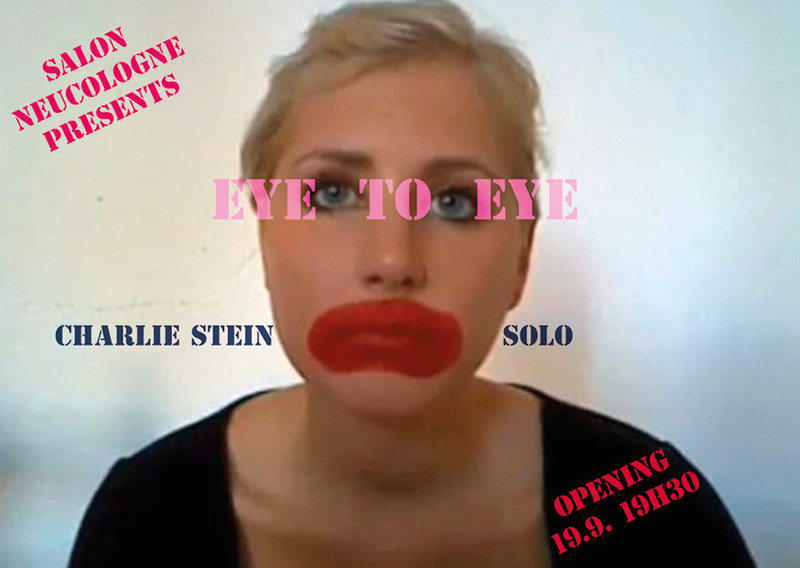 NOT READY, but MADE „EYE TO EYE“ Die Soloshow von Charlie Stein im Salon Neucologne e.V trägt den Titel „EYE TO EYE“. Sie zeigt u.a. die experimentierfreudige Unabgeschlossenheit ihrer Arbeitsweise. Das Delegieren bestimmter Prozesse, die früher als authentische Herstellungspraktiken der klassichen Kunstproduktion benutzt wurden fließt als Selbsttätigkeit einer Maschine ein, die zwischen Écriture Automatique und Ready Made wabert. Salon Neucologne e.V. 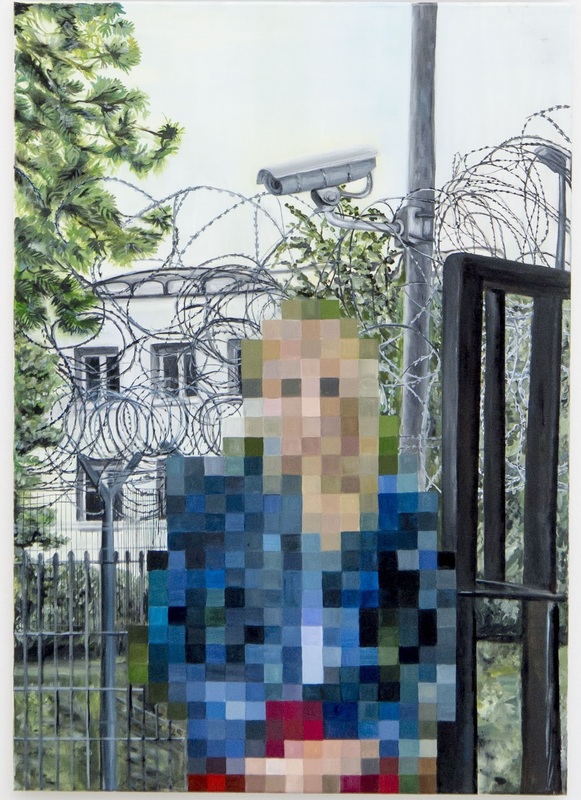 freut sich, mit der Soloshow von Charlie Stein erstmals eine Ausstellung außerhalb des Salons zu machen, in einem Raum, der in direkter Nachbarschaft und Sichtweite ist (Karl Marx Str. 58, 2.HH, 4.OG). So wird es auch eine direkte visuelle Interaktion zwischen den beiden Orten geben über die Karl Marx Straße hinweg, „auf Augenhöhe“ Eye to Eye. SWIMMING IN THE CONTEMPORARY POOL OF RESTLESSNESS Charlie Stein is an artist who, in her diversity and speed, has always been three steps ahead of anybody who tries to grasp her work. When we first met in 2014 we used the last 20 minutes of the opening hours for an express-visit of the “Schlemmer Exhibition” in the Staatsgalerie Stuttgart. Charlie Stein was quick to comprehend the artistic essence of the works displayed and I was surprised to discover new sides to this artist. An expedition that came to its harsh conclusion at the hands of the museum’s staff. Charlie Stein likes to test the limits, so she can overstep them. She draws, paints, makes videos, interview-projects and creates installations. She feels equally at home conducting her guerilla-operations in front of supermarkets as she does behind an easel creating classical paintings. An artist who plays with the perception impulses of our present time, without the fear of being drawn into the undertow of digital self-exploitation. Somewhere between Instagram and Facebook, between the hysteries of the art market and the protected isolation of her studio space. “The intention justifies the medium” she says – in her own way opposing the strained quote by Marshall McLuhan. Following Charlie Stein’s intentions is rewarding. You encounter surprising and sometimes strongly self-questioning works. Cascades of ideas, that roam around as long as it takes for them to take the right shape. “I’m always scribbling things into notebooks, on postcards, napkins, shopping receipts, even bank notes. I permanently feel like I am about to lose everything, if I don’t somehow get a visual hold of the thoughts that are going through my mind. Even while I’m driving, I oftentimes have to write things down and scribble sketches.” It doesn’t matter if the end result is a porcelain vase in the style of the chinese Ming-dynasty, or a selfie portrayed in oil, in front of the NSA-headquarters in Stuttgart. “A good image has to be finished at any stage,” says Stein, “that is, consistent within itself – even during the process of creation. Painting with this approach in mind sets me at ease, because it ennobles the in-between states from the beginning to the completion of the work.” A statement, that seems to refer to classic teachings. 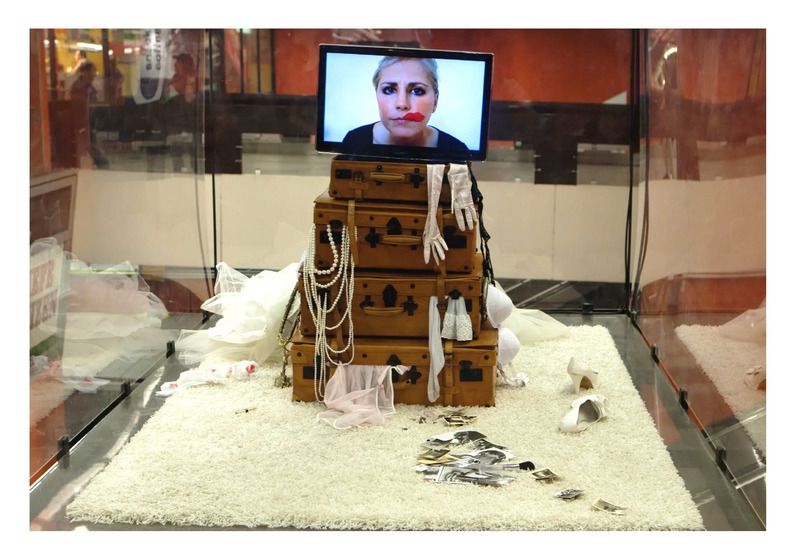 THE ARTIST AS A WOMAN Charlie Stein, being a young post-post-feminist woman, is often commenting on her role as a female artist, but she is never caught up in it. She says “Of course I’m an artist, who happens to also be a woman”. This ironically implies that she doesn’t work herself off in regards to the heirloom of the gender fronts. 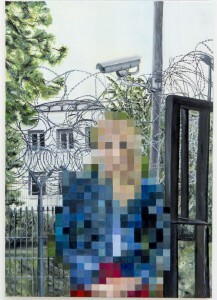 She is also fearless in using her own narcissisms as a material, or to reflect on the contemporary political dimensions. “Good art is not afraid of touching upon political discourse. Good art is always free, but also neither unambiguous nor expedient. Otherwise it would be propaganda or marketing”. CONSUME In the enigmatic, but simple work “Mindestlohn” (“minimum wage”), the receipt becomes the bearer of the statement. The “receipt”, printed on cheap thermal-paper, becomes an artist-edition and imbues an overdetermined concept with experienceability. 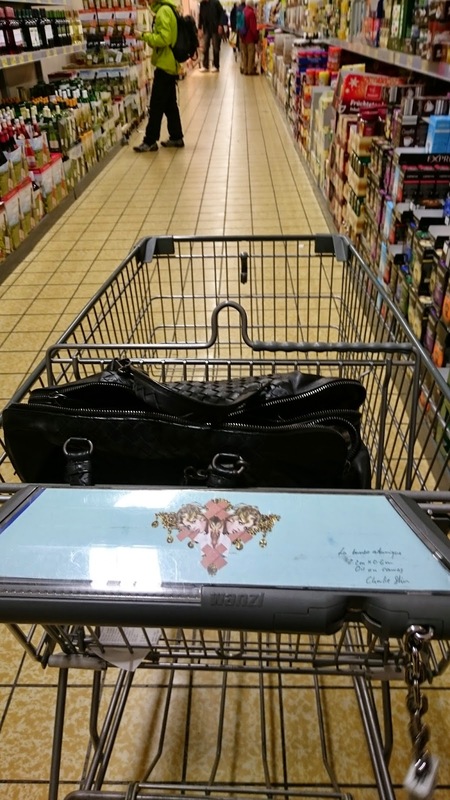 During a guerilla-operation in 2014 she transformed her favorite object – the shopping carts – into displays for ideas for artworks of artist friends of hers. AGENT OF HER OWN WORK Charlie Stein is an inquisitive artist who wants to know more about her being-in-this-world and who keeps exploring the question for art’s role in this world. Her strategies span from “trojan horses” to classical media to using her own charms and her irritability. She describes her work-process as follows: “You can picture it a bit like an ultrasound image of a thought that is still in the process of coming into existence. You are trying to make something that is hidden visible using ultrasound. The better you use the available material, the clearer the image becomes”. 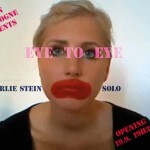 NOT READY, but MADE “EYE TO EYE” is the title of Charlie Stein’s solo-show in the Salon Neucologne e.V.. Among other things it shows the constant experimenting unfinishedness of her operating method. Delegating certain processes which used to be part of authentic creation in classical art-production to the automatic action of a machine aligns itself alongside with “Écriture Automatique” and “Ready Made”. 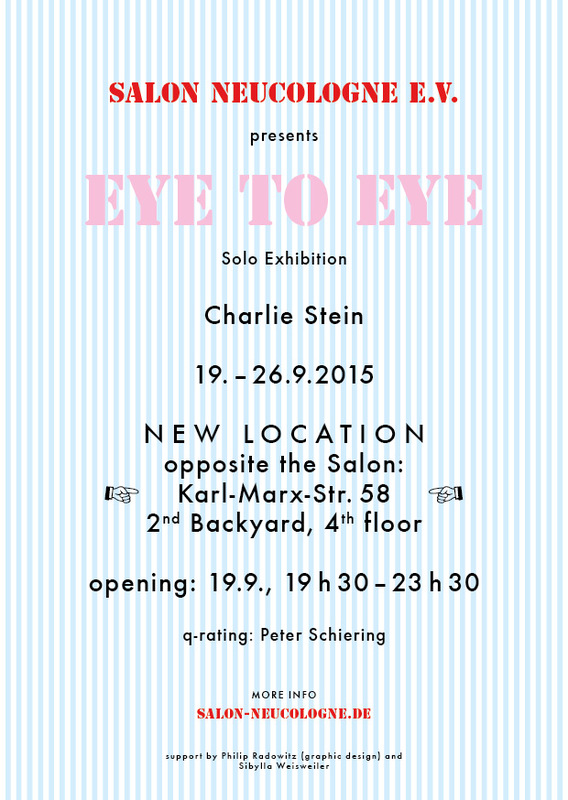 With Charlie Stein’s solo-show, Salon Neucologne e.V. 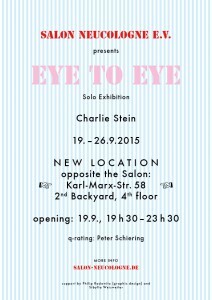 is happy to present the first exhibition outside of the actual Salon itself, in a space within viewing-distance (Karl Marx Str. 58, 2.HH, 4th Floor) just across the street. This way there will still be a basis for visual interaction between the two locations, across the Karl Marx Street, so to say “at eye level” respectively: Eye to Eye.